911uk.com - Porsche Forum : View topic - Into the tyre minefield. 911uk.com Forum Index > 964 (1989 - 1993) > Into the tyre minefield. Posted: Sat May 02, 2015 11:07 am Post subject: Into the tyre minefield. Recently, I bought a set of Eta Beta Krone, 18 inch, three piece wheels to fit on my C4 targa. Elie at Voodoo has done an excellent refurbishment job and now I need to choose some suitable tyres. I've studied the fora and tyre dealers' sites hard, asked far too many people far too many inane questions and I've finally come up with a set that I think will do the job. I am aware of the 'N' issue. So, to be on the safe side with my insurers, I've gone for an 'N' rated tyre. I've chosen Continentals for two reasons. Firstly, they seem to be quite popular on 964s and secondly, if one buys two or more Continental tyres at the moment, one gets a free weekend hotel stay. My driving style is leisurely. The car won't be tracked and nowadays, I'm more of a pootler than a drifter. However, I can still get a move on when I fancy. So, here's my choice. Would they be suitable? I've just shod mine with Avon to give them a try. I've had Michelin and they've been fine but tyre noise terrible. Probably a trait of 964 and old hard tyres rather than the tyres themselves. Thanks, Zingari. That's all I need. A confirmation that my choice will be OK. I've tied myself in knots over the past week or so. What with the various manufacturers and even within an individual manufacturer's range. Hence my description of a tyre 'minefield'. 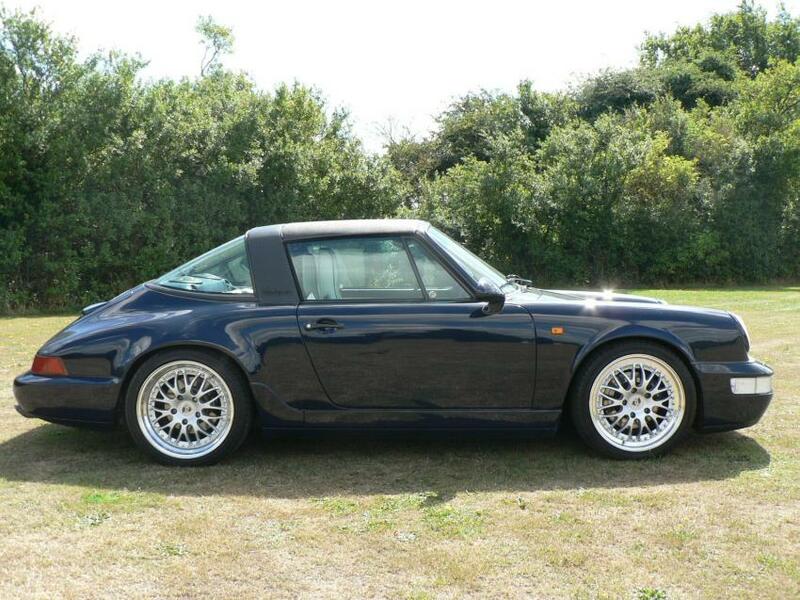 Have just replaced the rubber on my 964 with another set of Conti SC2s. I liked the feel of the old set, even though they were getting rather tired. The loan set of wheels which I had from Chris W at Exel Wheels (while he refurbed the wheels and fitted the new Contis) were Bridgestone Potenza S02 and I didn't like them as much. The car drives very well indeed on its new set of Contis - my driving is 90% brisk but sensible, 10% wringing its neck. I have fitted a set of toyo sport t1 r and find them to be very good the Michelin pilot sports are getting great reviews although not sure what sizes they are available. Thanks, flying_scotsman. It's good to read that my choice of tyre actually works on the road. Gazc2 thank you very much for that. Your car looks just right. I've had my Krone centres painted gold. Hopefully, they'll work well with midnight blue body work. As for the wheel size, I sourced the tyres through Protyre. They don't seem to stock 255s. Poster 'too old for this', who, incidentally, I blame for this whole situation after he posted photos of his Krones, had issues with fitting 265s. I think I'll try to get some 255s. As I said, it's a minefield out there. I've had a search around for Conti2s in 255/35/18 and there don't seem to be any. Even the Continental website directs me to Conti5s. However, as far as I can ascertain, the Conti5s are not 'N' rated. I need to speak to my insurers. Anyone have access to an up to date list of tyres that are N rated? I've found an old one online. But, it doesn't seem to have been updated for years. Horrible URL, just stick "porsche 964 recommended tyres" into google, about the 4th one down. The PDF has the latest information from August 2014. Thanks Mark. That's what I was looking for. Ha ha....my issues with the 265 turned out to be down to a couple of factors, jammed camber adjuster not allowing a decent setting/bent wing bumper support pulling the back wing in.Pretty sure 265 would have fitted.But I had already sold them and replaced with michelin pilot sport 255 BUT these are not N rated.It gets better though... picked a nail up in one rear after 60 miles, ruined and, this week, found that due to settlement of the KW3 after 600 odd miles and following a spirited little drive with a couple of mates,the front tyres had caught the bumper to wing join ,bent the tip of the wing out which then peeled the front tyres like an apple.So in under 700 miles I now need two new fronts and one rear,so will be biting the bullet and going to same size fronts and back to 265 on the rear.Yes the michys are a bit noisy,but the grip is amazing,so I will just hang on to each gear a little longer and drive with the window open to compensate. I bought the latest edition of Contis for mine last year, though they weren't N rated, very pleased with them, I would have bought Yokohamas but they weren't available in the size for the 17" wheels I have, personally I think Yokohama have the best grip of any tyre I've ever experienced and over the years I've tried most brands, got them on my X5, fantastic grip and they last a while too given the soft compound. In the end, I plumped for Contisport 5s. 225-40-18 and 255-35-18. I spoke to my insurers and they weren't bothered either by the wheel size - 18 - or my choice of tyre. I'm getting them fitted on Eta Beta Krones by JAZ in a couple of weeks. Along with Bilstein B6s and H&R springs, tear drop mirrors and a Steve Wong chip.